At this stage of the summer, I feel as if I am as exhausted as the plants in the yard. In fact, I am hard-pressed to find blooms that have not already been photographed and posted in previous “Bloomin’ Updates.” But the task was not completely impossible, thanks to some friends, some surprises, and some guests. This Pineapple Lily was given to me by friends, Catherine & Robert, when they arrived for dinner. I had never heard of a pineapple lily, but after reading up on it, I learned that they are from South Africa and require little care. In my cold hardiness zone, however, I will have to bring it indoors for the winter, and then restart the growing in the spring. I'll keep you posted on this new project. Last year, I planted a bed of Celosia "China Town." This year, I was treated to this surprise, self-sown, and very proud of its hot red stem. Yes, I could have weeded this out, but if a seed has managed to live against all odds, then it deserves the chance to live its full cycle. That being said, I think I'll plant them again next year. A full bed of red leaves, red flowers, and red stems truly looked gorgeous. I know this is technically not a bloom, but try explaining that to this guy. 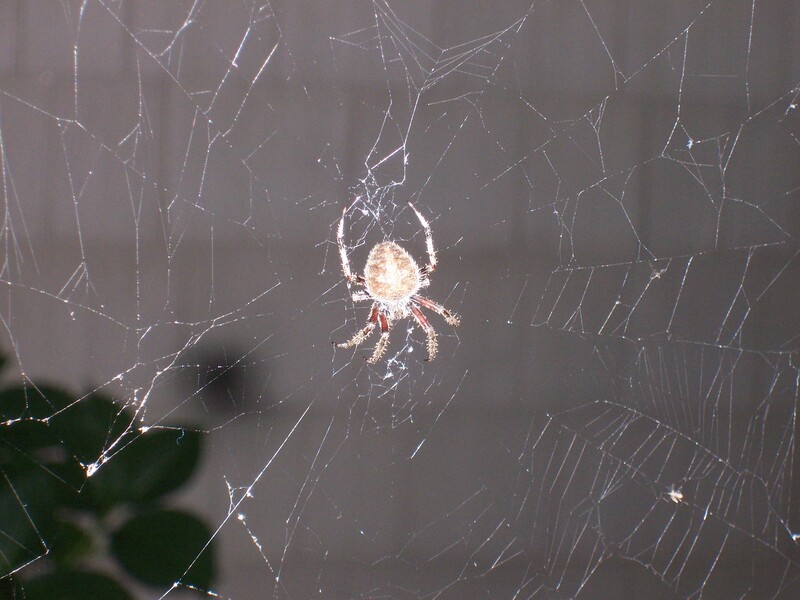 This spider creates a web each night. Joe and I tried to get a photo, so between my camera flashing and Joe's holding a flashlight, this is what we captured. The spider and the web seem to sparkle. Never mind Broadway's "Spiderman: Turn Off the Dark," this spider is probably telling us to turn off the light. We turned off the light, and surprised ourselves with this photo. 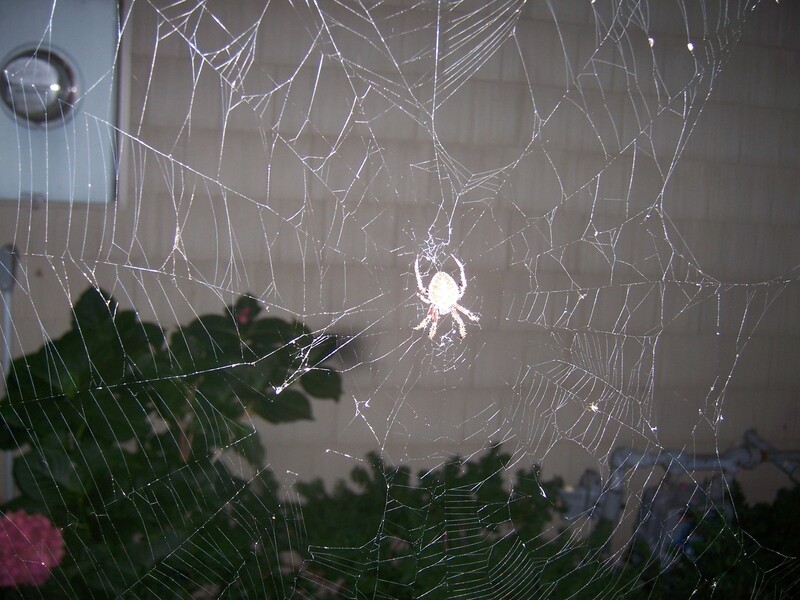 Actually, I'm okay with spiders, as long as they keep their webs away from where I have to walk. There's nothing like walking to the car and going face-first into a web. 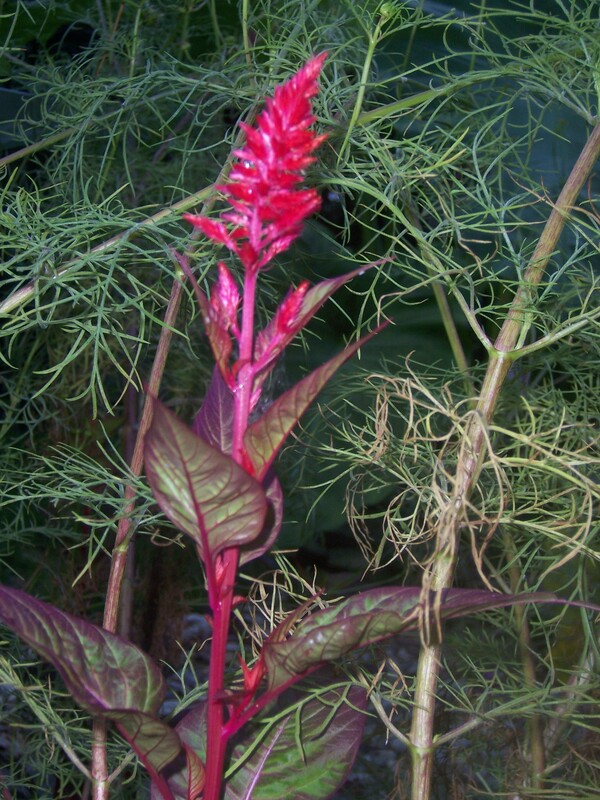 I like the surprises that you get in gardening – the China Town Celosia. I was teaching a Master Gardener class on annuals, perennials and bulbs and told the group how exciting it is to see the first new green shoots in the spring. Same way for plants that re-seed. Absolutely! I’ve posted previously about gardening surprises — they keep me coming back for more. Okay, earwigs I can certainly do without. Spiders? Like I said, if they respect my space, I’ll respect their space. If they get inside my house, that’s a line they shouldn’t have crossed. If I walk through one of their webs, I guess that’s the line I shouldn’t have crossed. Looks like a wolf spider– poisonous. Be careful! Thanks for the heads up. Poisonous or not, it’s big — so I’ll keep my distance. 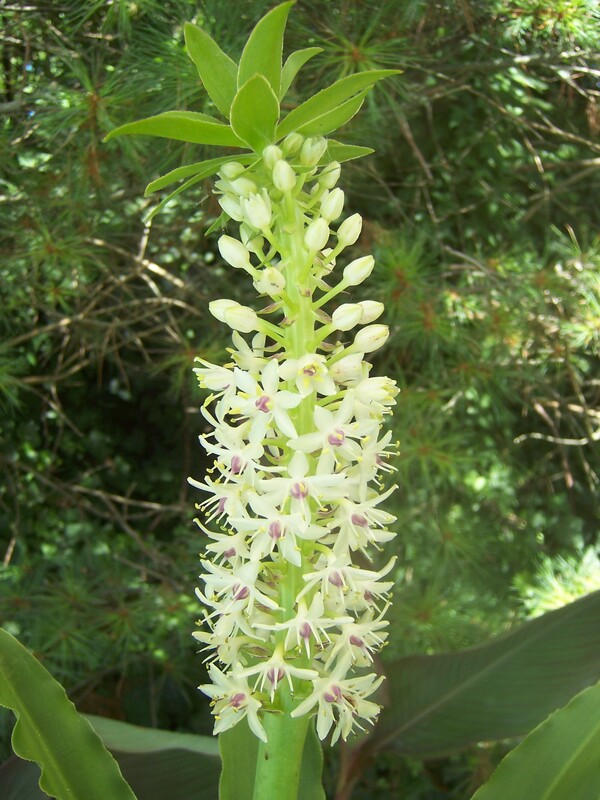 In your hands, how could that Pineapple Lily do anything but flourish and bloom! You do great things with great care. Enjoy the end of this season and start dreaming of the growing seasons to come! Thank you for your vote of confidence! I’ll do my best with the Pineapple Lily, and as for those dreams — I’m already there! Lovely blooms and great Spider pics! Hi Bridget. Thanks for stopping by. 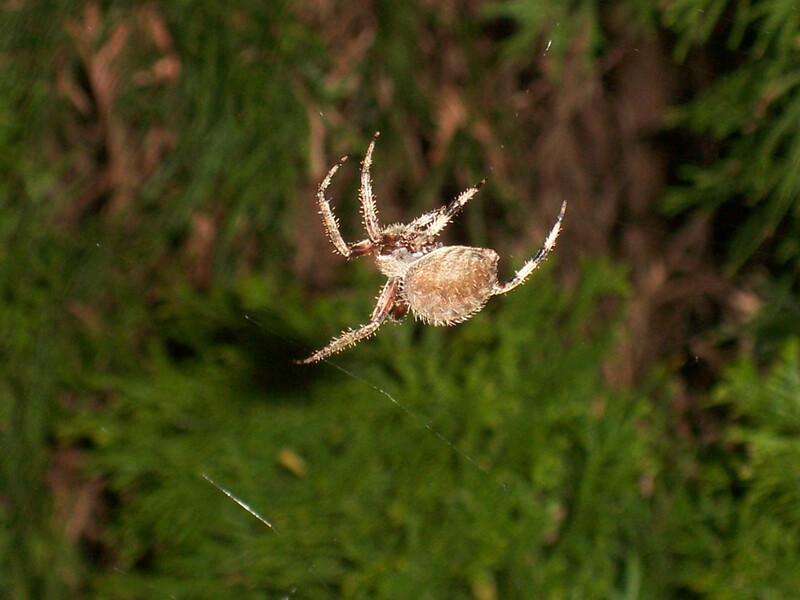 As for the spider pic, I actually surprised myself. I wasn’t even sure what I captured until I loaded the images onto the computer.